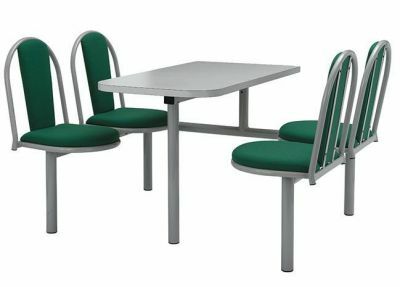 Traditional metal framed fast food units with upholstered seat and backs in a choice of vinyl or fabrics. The table top is finished in Formica laminate with a choice of a laminated or MDF edge. 15 - 20 day lead time. Traditional design fast food unit with a soft padded back and cushioned seat. Choose from a wide range of table top finishes and selection of contract grade upholstery options.